The Upper Ocklawaha River Basin underwent major declines in water quality and loss of river and marsh habitat over a century beginning in the late 1800s. Impacts came from a combination of dredging and canals dug for navigation, draining of marshes to establish farms, a series of locks and dams that altered water levels, and discharges of untreated wastewater and agricultural and industrial effluents into the region’s lakes. The St. Johns River Water Management District began work to restore water quality and fish and wildlife habitat in the basin in 1988 as part of the Surface Water Improvement and Management (SWIM) program. Restoration of surface water quality began with purchase of the former muck farms — a process completed in the early 1990s — which brought an end to the agricultural stormwater discharges to the basin’s lakes. Restoration work has included establishment of wetland restoration areas, projects to improve the way lake levels and flows are managed to sustain the water quality and habitat improvements. Purchased in 1991, this property occupies 3,000 acres of the old Ocklawaha River floodplain and about six miles of the historic channel. As part of a lease agreement with the district, the previous owner completed restoration work, including cleaning out the river channel and filling in ditches. The U.S. Department of Agriculture also funded some of the restoration. Currently, the Ocklawaha Prairie Restoration Area is open to passive recreation and duck hunting in the winter. After purchase in 1988, the district restored about 2,800 acres of former floodplain marshes along the Ocklawaha River. More than eight miles of the historic river channel runs through a variety of wetlands habitat. Improvements included installing water control structures, levee building and enhancement, and clearing vegetation that hindered flow through the restoration area. Part of the restoration was funded by the U.S. Department of Agriculture. 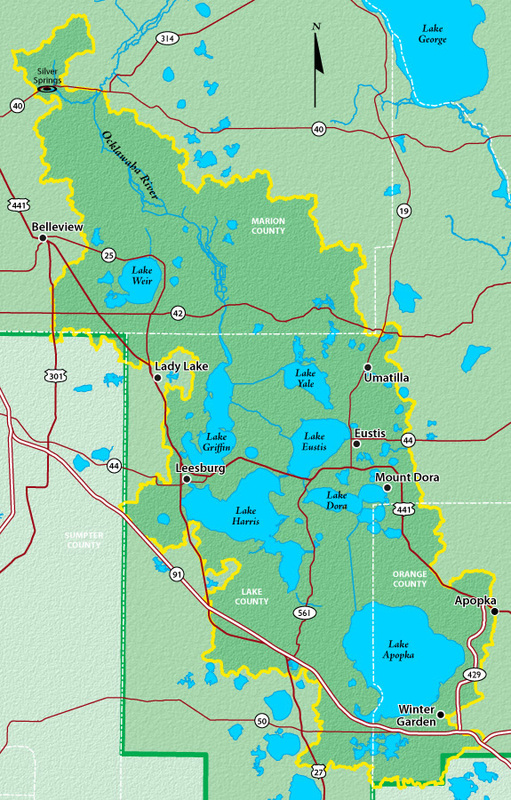 Many miles of recreational trails lie within the property, which is adjacent to Ocala National Forest. Moss Bluff Lock and Dam was originally built by the U.S. Army Corps of Engineers in 1925, primarily for navigation purposes in the basin. After upstream flooding in 1959 and 1960, the dam was rebuilt and enlarged as part of the federal Four River Basin Flood Control Project. Although the Corps owns the lock and dam, the district is responsible for its operation and maintenance. Wetlands have been restored on several parcels and about 2,000 acres have been reconnected to Lake Griffin. Wetland restoration activity continues on the remaining properties. The district partnered with Lake County to construct a one-way drive through trail that has become popular with visitors and residents. The former S.N. Knight Leesburg farm lies between Lake Harris and Lake Griffin. After purchase by the district in 1992, wetlands were restored on the property. Renamed Harris Bayou, this project plays an important role in the district’s ability to manage lake levels and flood control throughout the basin. The project allows up to 1,000 cubic feet per second of water to flow from Lake Harris to Lake Griffin. This supplements the flow through Haynes Creek from lakes Eustis, Harris, Dora and Beauclair. In addition to reducing the amount of nutrients entering the waterways from surrounding land in Lake Griffin, reducing the amount of internal nutrient recycling in the lake has vastly improved lake water quality. This has been done through the harvest of gizzard shad and the excess nutrients contained in their bodies. Large beds of submersed aquatic vegetation have also improved, further showing evidence of improved water quality. Find out more about gizzard shad harvesting in our educational resources. The district adopted interim lake level schedules for lakes Harris, Eustis, Dora, Beauclair and Griffin in June 2012. The district continues to work with the public and stakeholder groups to implement revised regulation schedules and set minimum flows and levels for the Harris Chain of Lakes and Lake Apopka. This new water regulation/management plan will help sustain the improvements in lake water quality and habitat, as well as protect recreation and navigation, improve fishing, and continue to provide flood control for the communities around the lakes.